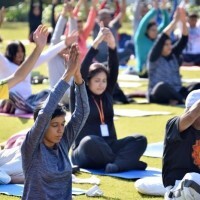 The Art of Living Yoga brought together some 50 million yoga enthusiasts in 132 countries worldwide to mark the first United Nations International Yoga Day (IYD) on 21st June. The programmes theme “Yoga – A New Dimension” allowed participants to celebrate the deeper dimensions of yoga in a session that featured yoga asanas and pranayama, yoga knowledge and wisdom, relaxation and meditation, creating a universal yoga experience for seasoned yoga practitioners and people without previous exposure to yoga alike. 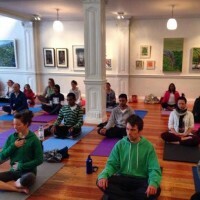 In Africa, 15 countries participated in celebrations organized or co-organized by the Art of Living Foundation as one of four official partners of the Government of India in hosting unique yoga events worldwide. 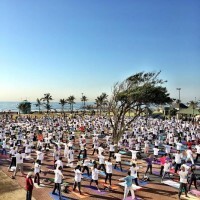 In South Africa, some 2000 yoga practitioners came together at the seaside in Durban and over 1000 yogis and yoginis marked the event at three different venues in Gauteng. 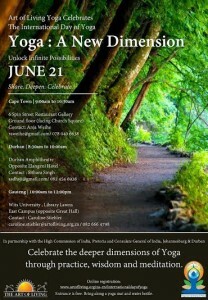 Yoga was also celebrated as a holistic experience in Cape Town and Grahamstown. “Yoga is something that can unite people across the globe, across nations, across religious divides. Everyone can come together with the spirit of togetherness. Yoga is not just about physical postures or exercises; it is a state of mind where you have a sense of belongingness, responsibility for the whole planet, and a sense of connectivity and harmony,” said Sri Sri Ravi Shankar, founder of The Art of Living Foundation holding the keynote speech at the United Nations celebrations for International Day of Yoga at the UN headquarters in New York on 21st June. Sri Sri Ravi Shankar also celebrated the day with some 5500 New Yorkers in a public event at Lincoln Center.